Structural Solar LLC is a design-build company who specializes in supplying highly durable and cost efficient carport structures for solar installations. 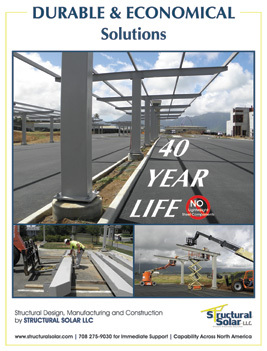 Particularly for solar carports in Hawaii and other coastal regions, corrosion and high winds are concerns. Structural Solar manages the design, fabrication, coating and installation of foundations and “module-ready” solar structures. While most of the solar canopies or solar carports are installed in parking lots, it is not uncommon to install architecturally attractive solar canopies over school drop off areas and even as elevated ground mount structures to be used for future parking areas. Structural Solar LLC is a high quality and service oriented supplier of solar carports with a broad portfolio of projects completed across the country. Structural Solar typically works as a subcontractor to leading solar integrators who develop solar projects at universities, hospitals and other institutional and municipal sites. The company has been recognized for award winning and cost effective design on high profile institutional and municipal projects and can provide signed and sealed structural drawings for any solar carport project across North America including solar projects in Hawaii. Structural Solar designs to stringent specifications assuring durability and long term customer satisfaction. Depending on owner preference, Structural Solar offers solar carports with industrial -marine grade paint or hot dipped galvanized coatings, proven systems against corrosion. Structural Solar utilizes ultra-efficient design process and can take the project from concept to completion quickly and seamlessly. Accordingly, the company has become the premier solar carport supplier for solar installations on the East Coast and now is embarking on projects in Hawaii. Structural Solar has manufacturing capability at eight locations across the country and can efficiently supply and install solar carports on the west coast and Hawaii. Structural Solar LLC designs and builds durable, attractive and economical “module-ready” solar carports. For more information on how Structural Solar can lower your solar canopy costs, visit the company’s website or call Bob Pegnato at 708 275-9030.